Keep all your loose documents securely in place with this clip folder custom clipboard. Leave notes in style with this Digital Display Custom Notepad with Stylus! This digital notepad will make your quick reminders noticeable easier. Windsor Reflections Logo Clipboard - 9.75" x 13"
Logo clipboard offers lightweight convenience for those last-minute meetings. This versatile personalized clip folder is perfect for seminars or any business occasion. 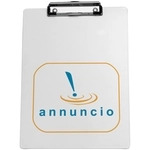 This 9" x 12" promotional clipboard is great for hospitals and schools. The Plastic Promotional Memo Clipboard is perfect for meetings and tradeshows. A small convenient size allows you to take just about anywhere. The Full Color Low Profile Promotional Clipboard offers a large imprint area to help showcase your logo, brand or event. This custom padfolio doubles as a clip board and features an inside pocket for storing additional documents or papers. Perfect for seminar & events! The Two-Tone Printed Clipboard w/ Jumbo Clip offers a large imprint area and can hold an 8.5 x 11 notepad. Choose from a variety of color combinations! Choose from a variety of color combinations! The Two-Tone Printed Clipboard offers a large imprint area and can hold an 8.5 x 11 notepad. Plastic custom clipboard will metal clip provides a hard writing surface anywhere! Plastic custom clipboard provides a hard writing surface anywhere! Magnet cusotm dry eraser is the perfect accessory to any dry erase board. This plastic custom clipboard provides a hard writing surface anywhere! Custom clipboards are a great item to personalized for your company or organization. If you are branding your office or needs marketing materials for a sales meeting, imprinted clipboards and memo boards are perfect. We've seen promotional clipboards and memo boards being used by medical offices, pharmaceutical companies, and even sports teams. Imprinted clipboards and memo boards are great for trade show promotions, there large imprint area is sure to be noticed by booth visitors. When you want great looking promotional clipboards, ePromos offers a wide selection of items for any occasion. Talk to our promotional product experts today to learn how we can help your company.